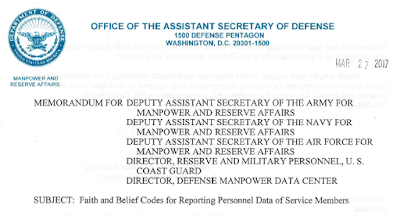 On March 27, the Office of the Assistant Secretary of Defense of the United States issued a memorandum on the subject of “Faith and Belief Codes for Reporting Personnel Data of Service Members.” The document from the Department of Defense announces that the Armed Forces Chaplains Board has approximately doubled the number of religious preferences recognized by U.S. Military Services. Ásatrú refers to a practice that grew out of the revival, reconstruction, and reimagining of Old Norse religion in Iceland in 1972. Heathen is a broader term that includes practices based on Anglo-Saxon, Frankish, and other Germanic sources. The Troth is a 501(c)3 religious organization for practitioners of Ásatrú and Heathenry; based in the United States, it currently has members served by official stewards in Australia, Canada, Germany, New Zealand, and the United Kingdom. The addition of Ásatrú and Heathen to the list of faith group codes for all branches is a major step in the long struggle for equal religious rights by Heathen service members. There have been other victories in the last few years. 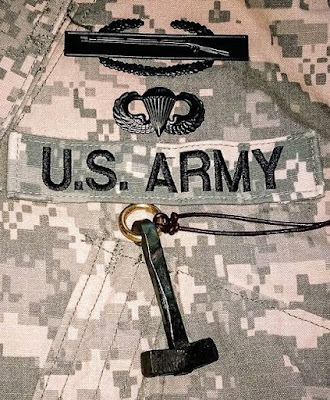 In 2013, the Department of Veterans Affairs added Thor's hammer to the official list of “available emblems of belief for placement on government headstones and markers.” In 2014, the Air Force added Ásatrú and Heathenry to its list of available religious preferences. In 2016, Green Party presidential candidate Jill Stein publicly supported the efforts of Heathen soldiers to gain equal rights. In January 2015, it seemed as if years of efforts by multiple Heathen soldiers had paid off as the Army added Ásatrú and Heathenry as options in its own religious preference list. After making news with an announcement that the request to add the religions had finally been approved, the Personnel Director at the Army’s Office of the Chief of Chaplains backtracked, said he had “mis-communicated,” and left Heathen soldiers in limbo. Despite a massive letter-writing campaign that began in May of that year, and despite the Department of Defense asking for and accepting a Heathen Resource Guide for Chaplains, no decision on the Army situation was forthcoming. The newly released memorandum from the Department of Defense has resolved the Army issue and removed the need for Heathens in other branches to continue the struggle for equal treatment. All Heathen service members can now have their religion officially added to their personal records. Until now, some Heathens have been lucky enough to serve in situations where their rights were fully respected. Others have had less pleasant experiences. It will be interesting to see how recognition of Ásatrú and Heathenry will affect the situation at ground level. In his 2014 interview with The Norse Mythology Blog, Air Force Master Sergeant (MSgt) Matt Walters explained why having their religion included on the religious preference list is important for Heathens who serve. It allows the military member to self-identify what religion or denomination they adhere to. This gives the military a way to have a more accurate view of the religious demographic, and in some cases can allow members of a similar faith to connect through the Chaplains Office. Further, in cases where the member passes away during a conflict, by selecting their faith and having their records reflect what they wish done with their remains, it gives them the ability to have their personal wishes respected in terms of burial and last rites. These items are important for two main reasons. First, given the difficulty of obtaining data on numbers of Heathens in general, it will be very helpful to have hard data on numbers of Heathens as a percentage of the general military population. Second, the statements about religious support and requirements of the Chaplain Corps seem to hint at the possibility of Heathen chaplains in the future – but only if the numbers show a need. 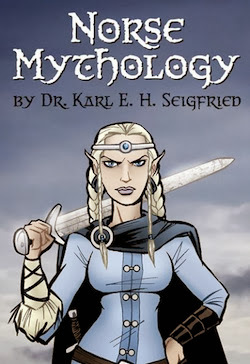 Looking at the larger picture, the fact that a department of the executive branch of the federal government of the United States of America has now officially recognized Ásatrú and Heathenry will hopefully have a positive impact on the lives of the wider Heathen population in the nation. Ásatrú has had formal recognition from the Icelandic government since 1973; this is likely as close as Heathens can get to an equivalent status within the laws of the United States. American Heathens have long had to deal with the personal and professional consequences of misunderstanding and misrepresentation of their tradition. There is no magic bullet to change how the wider population views a minority religion, but this seems like a real step forward. Many Heathens have worked very hard for the recognition of their religion in the U.S. Armed Forces. A few of those who have been most dedicated to the cause were kind enough to share their reactions to and reflections on the news. Their statements are followed by those of other Heathens who are, in one way or another, stakeholders in all of this. Matt Walters, Air Force Master Sergeant (MSgt), successfully engaged with the Air Force Chaplains Office and led his branch to be the first in the U.S. Armed Forces to include Ásatrú and Heathenry as options in its religious preference list. The Air Force allowing me to officially identify as a Heathen gives me a sense of comfort that, if I passed away during service, I would be honored in a way that would have met with my beliefs and not those of another faith. Each member should be able to openly identify according to their own faith. 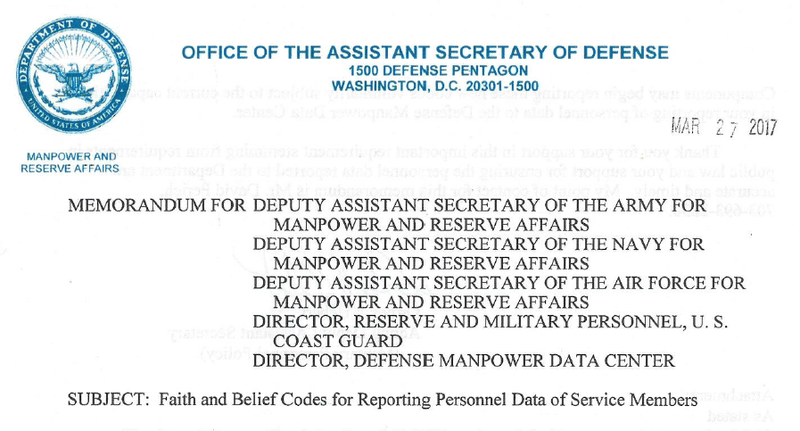 I think that the Air Force’s move to include Heathen and Ásatrú helped the Department of Defense as a whole to accept these faith codes. For that part of it, I’m proud of my efforts. I know that a great many others have worked long and hard for service members to be able to accurately identify themselves as Heathen or Ásatrú. This victory is the pinnacle of a long hard fight. In addition to our own win, those other faiths that may have been left out can now point to our inclusion as a means to justify their own faith being recognized. It shouldn’t be so hard to add new faiths, but each step that is taken is a win for everyone that values the freedom to choose. Click here for more from Matt. Daron Regan, Army Staff Sergeant (SSG), was a strong advocate for the Heathen community as he advised the Department of Defense on the beliefs, practices, and diversity of the tradition over the past two years. I'm honored to have been a part of this. Now begins the real work – to educate, grow, and support our Heathen community. Now is the time for each of us to reflect upon our future actions, thoughts, words and deeds – to support one another, to set the good example for others to see, to speak with knowledge and share with sincerity. This will be both a wonderful opportunity for us all, but also a burden to not be taken lightly. Daniel Head, Army Sergeant (SGT), moved the ball forward by engaging with the Army’s Office of the Chief of Chaplains; his hard work and persistence led to the approval of Ásatrú and Heathenry as options in the Army’s religious preference list in 2015 – until the approval was annulled a few weeks later. I’m glad to finally get closure on this administrative action and happy it was a positive outcome in our favor. I first submitted the request about three years ago and have constantly followed up regarding the status. I know Josh [Heath] has been pursuing this for even longer, so it's comforting – and definitely worth celebrating – to finally have our victory. This will make a difference for me, knowing that I and any of my soldiers in the future will have a way to ensure the proper services – postmortem included– while in service. Click here for more from Daniel. Josh Heath, Army veteran, has been involved in the quest to add Ásatrú and Heathen religious preference codes in the Army since 2009 and has supported Heathens in the military with The Open Halls Project since 2010. This is a small step toward encouraging equal religious protection. It has greater impact for service members, and it will allow for a more effective creation of communities around military facilities. The impact for non-military-affiliated Heathens is likely small, but it adds another layer of legitimacy before the laws of our land. It is no panacea for religious discrimination, but it is an important step. Click here for more from Josh. Nick Scott, Navy Reserve Mass Communication Specialist 1st Class [MC1(SW/AW)], served on Active Duty from 2009 to 2014 and is now a development writer at Roosevelt University and a member of Thor’s Oak Kindred in Chicago. It means a lot for my religion to be recognized by the organization I love so much. I have been a proud sailor for eight years, and I think every person who wears the cloth of his or her nation has the right to worship freely or not at all. That is one of the things I help defend when I wear my uniform. I am proud to have the right to claim Heathen on my service record and replace the “other religion” label I currently have. The Navy core values of honor, courage, and commitment are the same values I strive for in Heathenry. In my experiences, the Navy has always strived for diversity, and this is no different. We take pride in talented sailors, no matter their religion or philosophy. My shipmates have always been accepting of me as well as other sailors who might be Pagan, Christian, Jewish, Muslim, Hindu, Buddhist, Atheist, or Agnostic. That being said, being officially recognized by the top brass still feels pretty good. It's about time, and I'll believe it when I see it! Personally, I am humbled to be a part of something that is so strong and emotionally uplifting to so many soldiers – to give them the strength of belonging to community, frith [Old Norse “peace”], and kin. Out of the mead closet, at last! Robert L. Schreiwer, Steersman of the Troth, currently leads the only Ásatrú and Heathen organization officially recognized by the Department of Defense. Although the Troth's code has been in place since about 2011, the addition of Ásatrú and Heathen to the list of faith codes is very important to U.S. Heathens, both military and civilian. While we do not need a government body to lend us credence, in this case, it certainly does not hurt. 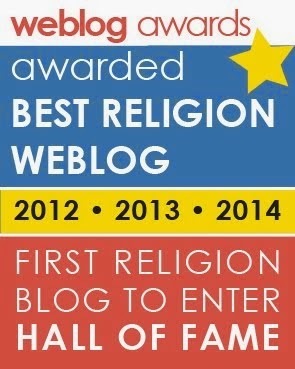 It raises our visibility and gives us a seat at the table alongside the major religions. The presence of these identities on the list may result in more religious resources for our military, which is the least that can be done for our folks who put themselves in harm’s way. Diana Paxson, Coordinator of the Troth’s Clergy Program, has long been involved in public advocacy for Heathens as she guides the training of those who may one day serve as military chaplains. Ten years ago, we were fighting for permission to put pagan symbols on U.S. military headstones. A Heathen veteran could not be buried under a Mjölnir [Thor’s hammer] until 2013. The decision regarding listing religious affiliation allows Heathens in the military to identify themselves as members of our faith while still alive. Hail the heroes! On a personal note, I would like to salute everyone who has worked for this victory, whether through direct engagement, advocacy, or support. My own respect for Heathens in the military has grown exponentially since I first began covering these stories in 2013. Almost without exception, the military Heathens I’ve communicated with have been kind, generous, and respectful individuals who care very much about right action and about publicly representing their religion in a commendable manner. I hope that all Heathens of positive intent can work together to build on the accomplishments of these good people who serve. Onward!